Hailey Kendrick always does exactly what's expected of her. She has the right friends, dates the perfect boy, gets good grades, and follows all the rules. But one night, Hailey risks everything by breaking a very big rule in a very public way...and with a very unexpected partner in crime. Hailey gets caught, but her accomplice does not, and Hailey takes the fall for both of them. Suddenly, Hailey's perfect life--and her reputation--are blowing up in her face. Her friends are all avoiding her. Her teachers don't trust her. Her boyfriend won't even speak to her for long enough to tell her that she's been dumped. They say honesty is the best policy--but some secrets are worth keeping, no matter the cost. Or are they? 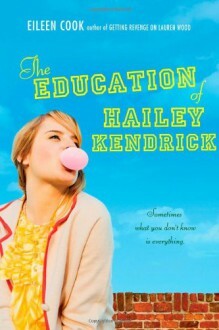 A really nice story.I loved how Hailey's character developed so much throughout the novel.She is such a loyal friend who is willing to take the fall for someone else.Drew was also such an awesome and funny character who helps Hailey see everything in a new light.